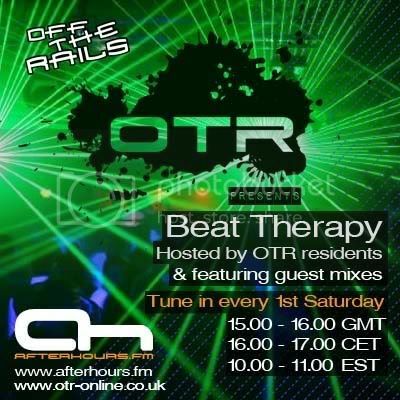 Just a quick message to let you know that this Saturday, 3rd October, at 15.00-16.00 GMT, OTR (Off The Rails) residents, Hiddenagenda, are going to be hosting the new OTR monthly show on internet station Afterhours.fm. The new show will be aired every 1st Saturday of the month 15.00-16.00 GMT (16.00-17.00 CET) and will feature ourselves and the other OTR residents hosting the show on rotation, alongside guest mixes from our headline acts. The new show, named 'Beat Therapy', marks part of the much anticipated return of the Sheffield club brand, OTR, to their home at The Plug, with the re-launch event taking place on Friday 23rd October. And to mark this occasion we've drafted in none other than Jon O'Bir for this months guest mix!!! So make sure you tune this Saturday between 15.00-16.00 GMT for some OTR 'Beat Therapy' and get yourselves warmed up for the weekend! !